Used as a Plaster on the navel. 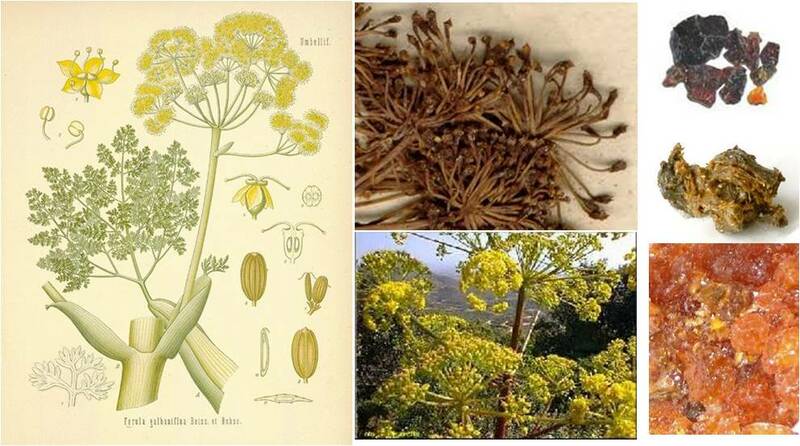 Galbanum is a gum-resin that flowed from the roots of a plant in Arabia, Syria and India known during the eighteenth century as “the Fennel-Giant”. This resin was bitterish in taste, bearing a very strong odor, and golden-yellow in colour, consisting of some white lumps. Water-based preparations were made from this resin. It was also used in compounds and plasters. Lewis notes very much the same regarding its medicinal effects. Lemery adds: “It softens, dissolves, discusses, and yet extracts Things forth of the Flesh… Obstruction of the Spleen, Liver, and Womb…Tumours, Nodes, Goudy Swellings…” Cullen felt its powers as a medicine were not significant. The root of this plant has been used by the Europeans as a spice for over a thousand years. Its oil has been valued by the perfume industries. As a medicine it has served as a stimulant, a carminative, a treatment for intestinal tract complaints, most notably nausea, and was sometimes prescribed for treating fevers. Pomet and Lemery discuss “Galanga Minor” (which came from China), and “Galanga Major”, (from Malaba). Little Galingale (G. Minor) was most often in use and was considered “an admirable Ingredient in Bitters, and in all Compositions that answer the Intentions of a Cordial or Cephalick.” It was considered an effective “Cephalick, Stomachick, Neurotick, Hysterick, and Antispasmodick”. Its characteristic sharp taste was considered to be “attentuating, opening, discussive, and prevalent against most Diseases of the Head, Brain, Nerves, Womb, Stomack, and bowels.” As for treating those in a state of Decay, as Osborn practices, it was felt to help one deal with “Indigestions and Want of Apetite”. Lewis recommends similar uses in the form of bitter infusions. Syrup recipe for the Spitting of Blood. This garden variety of Coltsfoot came from Europe and later naturalized as a wild herb in North America. It is possible Osborn is using the name “Garden Coltsfoot” in order to distinguish it from a local plant referred to as “Coltsfoot” by Cadwallader and Jane Colden, who resided just across the river. This local “colstfoot” was Wild Ginger (Asarum canadense), and had leaf form more appropriate to this name. The Garden Coltsfoot is a European species. Its Latin name “Tussilago” means “cough dispeller”, which is the plant’s primary medicinal action. It also has the reputation as being “nature’s best herb for the lungs and her most eminent thoracic”. The leaves were smoked for the treatment of Asthma, catarrh, and bronchitis. They have also been used to make a tea or syrup for treating colds and sore throats. The slow burning of powdered leaves followed by swallowing the smoke was used to treat incessant coughs. Rarely the roots were used as Osborn has recommended, although later this too became popular. For Consumption, this herb was burned for “a change of air” and taken to “sweeten the blood”. It was added to aromatic herbs such as Sassafras and Sarsaparilla to make syrups and lozenges. Recommendations for its use to treat Consumption and Decay go as far back as Dioscorides’s text where he recommends many of the above mentioned uses. Gerard called this herb “Coughwort” and felt the leaves had a drying quality. He therefore recommended them for “impostumes of the brest”. Lewis repeats this preference. Both the London and Edinburgh Dispensatories include it in their recipe for a Pectoral Decoction. Recipe for a Drink made with Rum. Dioscorides refers to the cultivated “Garluk”, or “Scorodon”, as well as the “wilde kinde”. He confesses that the wild kind is a great deal more pungent, and therefore more effective as a medicine. He adds: “But there is another wilde kinde, called Ophioscorodon. It hath a sharp, warming biting qualitie, expelling of flatulencies, and disturbing of the belly, and drying of the stomach….” Being eaten, he felt these would drive away worms, bugs, and “draw away the urine”. Culpeper agreed with all of the above, inscribing these effects to it being an herb of Mars. He felt it to served as a good medicine for breaking impostumes, and treating the dropsy, jaundice, falling sickness, cramps, convulsions, and piles. Cullen refers to the alexipharmic effects of Garlic, adding that it may be useful for the treatment of diseases where there is “a langour of the circulation” and rheumatism. In some cases, Sydenham claims he found that he could cure Dropsy with garlic alone. In terms of New York ecology and history, the local “wild garlic” Allium vineale is a possibility for this plant, but it is more than likely the case that Osborn tried to stay with traditions regarding this plant. The local wild species was very “gamey” and possibly interpreted as less valuable than the imported versions and domestically-grown foreign species. The root is most frequently used as a medicine due to its yellow color and its very bitter taste. It has served as a tonic for “the evil livers and stomachs” and strengthener for all systems of the human body. It has also been recommended for use as a febrifuge and an anti-septic. Many of the herbalists claimed it to be an alexipharmic for dealing with the bites of mad dogs, to resist poisons, to deal with pestilence and putrefaction, and to deal with the plague. As a febrifuge, it was used to treat intermittant fever, for which reason it was given the same common name as Jesuit’s or Peruvian Bark–the source for the Malaria drug Quinine. According to Cullen, only the bitters were recognised as the true tonics, so he gave a lengthy presentation on Gentian. By the eighteenth century Gentian was used as a bitters to treat dropsy by strengthening the blood vessels, changing the state of urination, and increasing normal secretions. In the case of treating intermittent fevers, it was felt to prevent problems of circulation that would lead to the rise in temperature. Also, it was felt that by invigorating the force of the blood flow to the surface of the body, this tonic supported perspiration, thereby breaking the fever. As a bitters, it was also felt thast it increased the appetite, promoted digestion, increased the tone of the stomach’s muscles, corrected acidity and flatulency of the stomach, got rid of abundant phlegm in the stomach, and resolved intestinal obstructions. Too much use, and it served as a laxative. Gentian was highly popular and was used to make powders, infusions, decoctions, tinctures, bitters, and wines; some of which served as medicines, others as daily tonics, and others as dietary supplements or substitutions. Electuary to take with Tea. Ginger originated in China and the East and West Indies; Dioscorides gives its origin as “Troglodyticall Arabia” (the Middle East?). Dioscorides mentioned the many medical virtues of this herb but does not mention a use specifically for treating the medical problems Osborn discussed. To make a confectionary or the candied Ginger roots: Steep the roots, cut them into long pieces, dry them, and then candy-coat them. The Laxative Confection of Ginger is “for cold Constitutions, to purge off watry (sic) and phlegmatic Humours…”, and is made of Ginger, Cinnamon, CLoves, Nutmeg, Saffron, Galingale, Turbith, Diagridium… confected with Sugar. Lewis recommended Ginger for treating “cold flatulent colic”, and “laxity and debility of the intestines”. Cullen felt its served as an anti-spasmodic and an aromatic carminative. They make little mention of its use in treating chest disorders. Used as a cooling purge. This compound was introduced as a cathartic by a German physician-chemist from Amsterdam, Johann Rudolph Glauber, around 1650. Today it also known as Sodii Sulphas, and Vitriolated Soda and contains mainly Sodium Sulphate. As a medicine it served primarily as a purgative. An old recipe for producing the salt describes a process whereby soot from coal is extracted of sulphate of ammonia, which then goes into making the proper salt for Glauber’s Salt. On and off throughout local history, attempts were made to find local equivalents to Glauber’s and Epsom’s salts in the Hudson valley. This practice became essential to local economy and medical practices during the very early 1800s, but was not adhered to that much by colonial physicians, except when the needed imports became a necessity. Even then, the use of local Glauber and Epsom salt like mineral spring end-products was unusual. Most of the Springs of the Valley were sulphur springs, not the purgative waters like Glauber’s and Epsom. to be used in a Hectic. for all Disorders of the Hectic kind. Two species were most often employed as medicines: Solidago virgaurea and S. odora. Both were originally European species. Local species in North America may have become important as well as the European medicines became more scarce just prior to and during wartime. The Latin name “Solidago” comes from “Solidare” for “to make whole”, referring to its use as a wound herb. Goldenrod contains bitter pronciples which make it an astringent and stimulant. It has been used for treating a variety of disorders including gravel, dropsy, fevers, poor menses, poor digestion, an diphtheria. One species, S. odora is highly aromatic and has served to treat nausea and vomiting as well. A century later, Culpeper wrote very much the same in his herbal and adds very little to the overall description. Historian Estes notes that the sweet smelling variety of Goldenrod (S. odora) was most often used as a stimulant, diuretic, and cathartic. The other, Virgae Aurea (Solidago virgaurea), was valued for its astringent, diaphoretic, and tonic effects. for old lingering disorders of the Hectic kind. Guaiacum is a tree from Hispaniola (the Spanish West Indies) that was introduced into Europe around 1508. Ten years would pass before it would be promoted for the first timefor use as a medicine–namely for the treatment of venereal diseases, especially syphilis. It has since served as a stimulant-febrifuge, diuretic, cathartic, and anti-rheumatic; and remains in use as an expectorant and testing agent for invisible blood stains and hidden/occult blood. The outer bark of the tree is its weakest part. It is acrid, pungent, aromatic and bitter. The acrid-stimulant properties can cause an increase in body temperature, thereby keeping the patient warm. Weak water-based liquors are used to produce medicines for the treatment of lung disorders; examples include spirits of wine, rum and brandy, and the compound tinctures. The resin and wood (known as Lignum Vitae) have also served as medicines, the resin being the strongest in medicinal quality. Guaiac resin is typically hard, tear-drop shaped, and yellow to red-brown in color. It has a balsamic odor and slightly acrid taste. By the eighteenth century, this resin was valued as a warm, stimulating medicine, used to strengthen the stomach and intestines, promote the excretory glands, and enhance the flow of sluggish serous humours. This last effect was associated with the treatment of Rheumatism. Ammoniacum is a gum-resin exuded by the flowering and fruiting stems of Dorema ammoniacum, and possibly other related species. It was considered highly medicinal during the early Age of Alchemy. The gum and the associated drug are named in honor of the collections that were carried out in Libyan deserts in association with the location where the Temple of Jupiter Ammon once stood. “Armoniac” is an obsolete version of the same name. As a medicine. it was recommended for treating “Asthmas”, and “to discuss hard hard Tumours in Womens Breasts”. Pomet adds: “An Extract of it takes off Roughness from the Windpipe, thickens thin and sharp Rheums, which fall down upon the Lungs; and is used in Pectorals for the same Purposes.” The Spirit of Ammoniac was also felt to “open Obstructions.”. Cullen felt the gum to be acrid and heating, and bearing mild anti-spasmodic powers. He recommended its use as an expectorant. He also felt it would resolve tumours when externally applied. Part of a Balsam Recipe and a Pectoral Expectorant. Gum Benzoin, also known as Gum Benjamin, is produced by a tree native to the Cochinchina and the East Indies, namely Siam, Sumatra, and Java. The balsam varies according to where it is harvested. Sometimes the Balsam of other Styrax species such as Styrax Calamita was used as a substitute. Gum Benzoin was first identified during the early seventeenth century. It was sometimes referred to as Sal Benzoes, or Salt of Benzoin, because of how it was used to make medicines. Along with other balsams such as Balsam Peru, Balsam Tolu, and Gel of Aloes, it was used to make Benzoinum tinctura Composita, or the Composite Tincture of Benzoin. Lemery recognised two types of this balsam: tears and lumps. He recommended that one choose this resin in the form of tears and “of a golden yellow without, and White within, with reddish and whitish clear Veins; brittle, without Taste, but of a sweet, agreeable aromatick Smell.” He goes on to describe how to produce the flowers or needles of this balsam. (See Flor Benzoin). The virtues of Gum Benzoin include its effects as an external antiseptic, and internally as a carminative, diuretic, and mild expectorant. Lemery felt the needles “subtilize bad Humours and expel them through the Pores of the Skin, as to loosen and expel the thick and viscous by the ordinary ways; chiefly those in the Breast and Lungs.” Thus it was recommended for dealing with “the asthmas”, consumption, coughs, colds, and other obstrucitons of the lungs. He also felt it could procure an excellent sweat in venereal Cases and fortify a weak Stomach. These properties made it an important ingredient in Turlington’s Balsam. See: Flor Benzoin; Gum Styrax; Turlington’s Balsam. Turlington’s Balsam of Life recipe. pill coche recipe with Ivory Castile Soap. Used in Balsams, and an Electuary. This gum, better referred to as Liquid Storax, is obtained as a balsam from the inner bark of the tree. It was referred to by Dioscorides as “Sturax”, and described as “the Lachryma of a certainne tree…”. Later, when Pomet wrote about Storax, he described three kinds: Red, Calamite, and Liquid Storax. Red Storax was a kind of Frankincense and appeared as such, being rough, translucent and irregular. Calamites Storax formed into: “Tears, white within and reddish without, of a middling Consistence, and of a Sweet fragrant Smell…fat, clammy, soft in handling.” Liquid Storax took on a white appearance and could be beaten with oil, water or wine to make ointments. Most forms of Storax were used medicinally as stimulant expectorants. They also helped to prevent oil or fat-based preparations from becoming rancid and were added to recipes to act as a preservative. Diuretic(? ); given as part of a drink, or as a powder? This gum-resin is extracted from a plant in Southeast Asia. It was originally found on the peninsula of Cambodia (thus its name), but later Siam and Ceylon also became important sources. In 1603, it was introduced to Europe by Charles de L’Ecluse, a French physician. By 1615, the East India Company was promoting its potential uses to England. As a medicine, it has served as a very potent emetic and vermifuge and an assortment of traditional proprietary medicines have made use of Gamboge. Pomet notes: “It both vomits and purges admirably, carries off water Humour, and is chiefly used against Dropsies, Cachexias, Gouts, Scabs, and Itch.” Due to its powerful purgative effects, a few grains of Gamboge were typically administered with a little sugar. Haarlem Oil was named after a city in the Netherlands where its inventor, Claas Tilly, discovered the recipe. As a proprietary medicine, it lasted well into the nineteenth century and later became known as Welch Medication due its popularity amongst Welch and Germans who used it for strengthening and tonifying the stomach, kidneys, liver, and lungs. The original recipe for Harlem Oil included Turpentine, Guaiac, Spirit of Nitre, Oil of Amber, and Oil of Cloves. Later recipes made use of Linseed Oil and Balsam of Sulphur as well. Take Sublimed of Flowers of Sulphur, 2 Ounce; Oil of Amber, 2 Ounce; Linseed Oil, 1 Pound; Spirits of Turpentine, sufficient to produce a thick preparation. Boils Sulphur in Linseed Oil, Add Oil of Amber and Turpentine. [Dr. A.W. Chase]. This medicine was used to treat a variety of other disorders as well including headache, worms, dropsy, and gravel. Once the Revolutionary War was over, the Harlem on Manhattan was made popular by the marketing of Harlem Springs. This was simply fresh water seeping out of the terrain in an uphill area of this island, fairly close to a lake or pond that was also in this region. These springs were marketed for use as medical springs beginning in the late 1780s. Other Springs in northern New York were sulphur rich and considered medicinal, but were not anything likened to haarlem oil. In Seneca, New York, there was a thick viscous spring known as Seneca Springs which approached the nature of the Haarlem Oil noted by Osborn. But the true Haarlem Oil was a proprietary recipe, not a natural product, so the marketing of the two remained unrelated as attempts were made to develop local markets for similar medicines. Centuries before, Dioscorides noted its value for treating the dysentery. Pomet adds that he felt the oils, spirit and salt served as great Cordials, and as treatments for fainting, swooning Fits, Heart-burnings, Convulsions, Falling-sickness, hysterical Fits, and for provoking Sweats. The calcined powder was recommended for stopping the Fluxes. The chemists and alchemists noted several things about Hartshorn. The antlers served as a source for ammonia when treated properly. Thus it was considered a volatile alkali, and could be made to serve very much like smelling salts to victims of lethargy, hysteria, and hypochondriacal complaints. Calcium Phosphates were also obtainable from antlers, perhaps resulting in its use as a tonic when powdered or burned to produce an ash, or what alchemists considered a salt. The Harts Horn had these and many other uses due to its behavior in the views of an alchemist. It gave off the three elements that alchemists felt represented the physical existence of the object–the mercurial, sulphur, and earthy components. The first, most closely associated with spiritual existence of an object, was the Spirit of Hartshorn (or Spirit C:C:). This was the ammonia-like smell that the antler produced upon immediate exposure to the fire. The sulphuraceous component came several minutes later and generally smelled putrid, if not rancid. Finally, once all of this was burnt off, the ashes remaining represented the earthy element of the antler (referred to by Osborn as the Sal C:C:). To help deal with a spitting of blood. Cannabis Hemp is well known for its fiber-producing capacity. It is one of the first products to be produced in the United States for shipping to England during the seventeenth century. In several of his initial letters to England, Governor Colden recommends that flax and hemp be grown so that Britain may prophet from the isolation that the colonists so desired. This hemp could then be used to produce netting, cordage, etc. An oil expressed from its seeds was also of value. As a medicine, an infusion of the seed was most often used. It was generally administered for the relief of pain. Other uses for it during the eighteenth century included as an astringent, anti-convulsant, anti-tussive, and analgesic. Culpeper recognised it for its value as a “drier” and noted that although it was “hurtful to the stomacke and head…it consumeth wind.” Later, the resin of this plant also became important in medicine, serving as a sedative, a sleep inducer, and a pain reliever. Osborn used it as such for the treatment of victims of serious decay brought on by lung disorders and the like. The growth of Cannabis hemp for its fibers was attempted in the early 1700s by a governor who owned lands south of Dutchess County. How much of a success his attempts were remain uncertain. After the Revolutionary War, the main plant fiber remained Flax, not Cannabis. This suggests Cannabis was more difficult to grow than Flax, and so didn’t become as popular a cultivar as other fiber sources. Tincture to add to a Tea. Hiera Picra was also known as Holy Bitters. It was made from tinctures of Aloes and Canella, and served as the basis for a Wine made from Aloes. The London and Edinburgh Dispensatories give different recipes for producing this Powder. The recipe in the London Dispensatory made use of Socotrine Aloes and Canella alba, whereas the Edinburgh Dispensatory incorporated Virginia Snakeroot, Ginger, and Cochineal instead of Canella. These powders were occasionally made into an Electuary. Often, the powder was not applied due to its nauseousness. Instead, Tincture of Hiera Picra was employed and considered to be “a much more commodious and agreeable Medicine”. Also known as the Sacred Tincture, Tincture of Hiera Picra was prepared by adding slightly over one Ounce of this powder to one and a half Pints of Spanish White Wine. Then it was set aside to digest for a week, or set on sand-heat for two days. Afterwards, it was strained and filtered. Fuller noted in his recipe, “This Powder is Aloes corrected with Spices, and proves beneficial to the Head, Stomach and Intestines.” He considered it to be of use for treating “Persons of a hot Constitution”, such as those with Erysipelas (St. Anthony’s Fire), Pleurisy, the hectic fever, Heartburn, or hemorrhages. He discouraged the use of the Electuary, giving preference to the Tincture instead. James made his own recommendations. Aside from its use as a stomach purge, he felt it served to amend the appetite, and treat Chlorosis (the Green Purges), Cachexy, and “Supression of the Menses”. Finally, Lewis adds that it cleanses the primae viae and is of excellent service in languid, phlegmatic habits. A remedy for a Proprietary medicine. Spirit of Wine 32 fluid Ounces. It was used for for treating coughs. Osborn makes a reference to the use of the “balsms of huney” for treating Dropsy in cases where there is also “a Cough and a Stopage on the Lungs”, in which case he refers to the need for expectorants. Osborn’s recipe, as given in the back of his manuscript, is vastly different from the above. It makes use of Oleum Terebinth, 2 ounces, Sal Ammoniac, 2 ounces, and Camphor 2 drachms. He recommends it for dealing with cases of pleurisy by bathing in it or rubbing it onto the surface of the parts affected. Hog’s lard was traditionally used as a base for many Ointment recipes. It’s primary medicinal effect is as an emollient. Hog’s Lard is officially known as Axunguentum Porcinum. Osborn used it primarily as the base for his ointments and may have not taken its medicinal virtues into consideration, using it primarily as a vehicle for the other medicines that he added. Dia Drink Beer for all Decay. The “Thistles” represents a group of plants bearing bristly, sometimes thorny leaves. They are found growing all around the world. Many have escaped into North America from herb gardens, including this medicinal species. 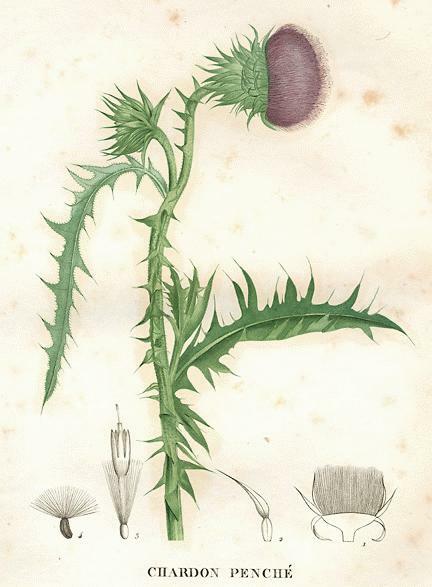 Parkinson recommended the distilled water of Holy Thistle for treating “agues of all sortes,” expelling worms, cleansing the liver, to “provoketh sweat and urine”, and as “a friend to the stomacke overcharged with chollar” because of its bitterness. A recipe for the Distillation of Holy Thistle is given by Lemery. An extract or juice is prepared, and then dryed and crystallized. This powder is pounded with a Mortar and Pestle, added to juice(s) of other plant(s), and distilled over a moderate fire. He considered the resulting water to be sudorifick, and capable of driving out the Small Pox and the Plague. Cullen felt it was “a simple and very pure bitter, but not a strong one”. Osborn favored its use as a tonic for the treatment of Decay and other feverish states. Balsam of Honey and Pectoral recipes. Used as part of a Bee’s Hive. Apothecarian grade honey traditionally came from Paris whenever possible during the eighteenth century and was shipped in stone pots. Of course local sources existed but they were not used except as food or whenever there was a high demand for honey resulting in the need for substitutes and adulterants on behalf of the local stores and apothecary shops. Although the best came from hives in Paris, artificial hives sometimes had to suffice. Lemery defines Honey as “the most Balsamick substance of several Flowers, for which the Bees do separate and carry into the Hives for nourishment…” Lewis described it as “a vegetable juice”, suggestive of its origin. Pomet, Lemery and Lewis recognised two kinds of Honey: White and Yellow. Of the White, or Virgin Honey, Pomet notes it was made without exposure to fire and dripped from the fresh comb. It may be forced out of the comb with a press as well. It is preferred over the yellow honey as a food, for it had a pleasant taste and an agreeable smell. The yellow Honey was considered better than the white Honey for use as a medicine, as it was felt to contain “more Spirits that the other…”, and an ill-scented Honey was most fit for an Apothecary to sell. It was produced by placing the honeycombs in bags and then into a kettle with a little water over a fire. The heated combs were squeezed over the water to release their honey. The yellow appearance wa s brought out by the heating process. Medicinal honey was used to prepare recipes with aromatic herbs such as Roses and Violets. Honey was also part of the recipes for Theriac Mithradite, Venice Treacle, and the Diascordium Electuary; and has been made into water, spirit, and oil preparations. The medicinal virtues of honey include as a restorative for consumption, a diuretic, and in high doses, a purgative capable of causing griping. For use in the treatment of pulmonary disorders, Lewis felt it was “a very useful detergent and aperient, powerfully dissolving viscid juices, and promoting the expectoration of tough phlegm.” Pomet considered it to be “One of the best Ophthalmics in the World.” Osborn may have been familiar with these medicinal effects of the Honey, although it is more likely he used it in the traditional sense–to add a more pleasant flavor to the medicine being prepared, which many were in most need of. See: Bees Combs; Dr. Hill’s Balsam of Honey. This Proprietary medicine was patented in 1743 by John Hooper of Reading, England, at which time it was considered to be “the best purging stomakik and anti-hysteric” available. Aloes Barbadensis, 8 parts; Iron Sulphate, 4 parts; Black Hellebore extract, 2 parts; Myrrh, 2 parts; powdered Canella bark, 1 part; powdered Ginger, 1 part; Soap, 2 parts; Water, added as needed to produce a mass. Divide into pills, each 2 1/2 grains. A similar recipe is given in Beasley’s Druggist’s Receipt Book (1866). All of these ingredients were available to Osborn and are found in several of his other recipes. Recipe for a Syrup to be taken with a Balsam. Recipe for a Dia-Drink Beer. This is a European herb that has naturalised in North America, and can be found growing along its fences and roadsides. Later herbalists like Parkinson, Gerard and Culpeper would recommend it for very much the same disorders. Gerard notes a confection made from its leaves and sugar as “a most singular remedie against the cough and wheezing of the lungs…” feeling it “doth wonderfully and above credit ease such as have been long sicke of any consumption of the lungs…” This use of Horehound continued to be practiced by doctors and herbalists throughout the eighteenth century. Both Lewis and Cullen included it in their presentations and recommended it for treating humoural asthma and coughs, jaundice, and other chronic disorders. Today, Horehound is best known for its use in making cough drops, a syrup, and candies. Decoction for a Dia-Drink/Constant Drink. Recipe for a medicinal Drink. Indigenous to France, Horseradish has naturalised to North America by escaping from herb gardens into nearby marshes, creeks and brooks. In Pharmaceutical Latin it was known as Raphani Rusticani. Its common name “horseradish” comes from “coarse radish”, a term once used to describe the taste and texture of its roots. The word “horse” has also been used to differentiate an inedible plant from an edible look-alike, in this case, the common radish. The pungency of this plant gives it properties similar to those of Mustard. It makes this plant a powerful stimulant, rubefacient, counterirritant, antiseptic, and blistering agent. During the 18th century this herb was used primarily as a tonic, diaphoretic and diuretic. Sydenham recommended it for treating the Dropsy, particularly in cases following the intermittent fever. The roots were extracted using water or a rectified spirit. The London and Edinburgh Dispensatories gave similar recipes for “Aqua Raphani Composita” incorporating: Horseradish root, Scurvy Grass, Orange peel; Nutmeg, or Juniper fruit and Canella alba. These are added to a Proof Spirit and Water, or Brandy. Lewis felt these recipes “helped stimulate the solids”, and promote fluid secretions, thereby effecting even the minutest of glands. Cullen related the effects to diuretic effects noting: “carried into the blood-vessels, (it) passes readily to the kidneys, and proves a powerful diuretic.” He felt that its ability to act as a stimulant, in particular of the kidneys, without causing inflammation, made it an effective treatment for the hip gout, as well as arthritic and rheumatic cases. Osborn recognises the use of this herb primarily as an internal medicine, and makes use of other plants as external medicines. Recipe for a Syrup to take with Balsam. Recipe for a Constant Drink. The Hyssop is a native of France and America. A strong volatile oil is responsible for many of its medical benefits. Infusions of the flowering tops were made for use as medicine, as well as distillations of its essential oil. The use of Hyssop has centered on its effects as a Pectoral, an anti-tussive, and a carminative. The herbalists agree that Hyssop’s value is as an expectorant. Dioscorides felt that this herb, when boiled with Rue and honey, the decoction helped one to deal with coughs, a shortness of breath, and “rheumatic distillations of the lungs”. Parkinson explains how this was accomplished: “The common Hyssope is much used in all Pectorall medicines, to cut fleagme, and to cause it easily to be avoided.” He recommends it for the treatment of other disorders as well including wounds, joints, “the sinewse”, and “the Falling Sicknesse.” Culpeper also felt that this herb served as a “violent purger of choler and phlegm.” He recommends a syrup or electuary for treating lung disorders. 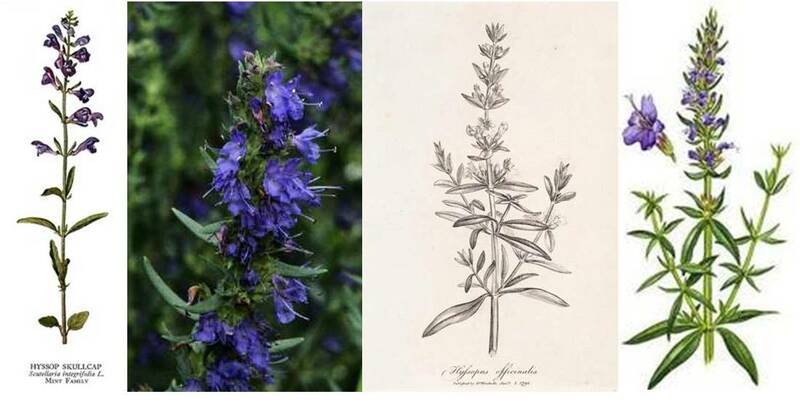 Applications for the Hyssop did not change much by the eighteenth century. Lewis recommended it for very much the same diseases, namely humoural asthma, coughs, and other disorders of the breast and lungs. Cullen suggested that it works by resolving “coagulated fluids”, although he questions its efficacy as a medicine. In his discussion of the treatment for Rheumatism Osborn gives a number of recipes for treating patients with joint pains. Near the end of this section, he discusses treatments for severe cases where the joint pain has not subsided. He notes: “Isues in This Case very benificel—-“. Osborn is referring to the development of an infection in the joint space; one that requires an incision to be made so as to cause a discharge of the pus from the joint space, and thereby reduce the pain and hopefully initiate a healing process. He goes on to give a recipe for peas he found to be “more stimulating, and are used to increase the discharge”: Yellow Wax 1/2 oz., powdered Turmeric 1 oz., powdered orris 1.2 oz., Venice Turpentine, (sufficient to form a mass). Osborn of course does not give us a recipe for producing the issue pea he is referring to. But a recipe incorporating materials that we know he used such as bees wax, orris root, venice turpentine and a source for a yellow dye (saffron) could have been employed by him. Recipe for a Spitting of the Blood. Also known as Jalapa or Jalapium, this plant was discovered in New Spain and brought back to Spain in 1609. It receives it name from the province of Xalapa, in what is now Mexico, where it was discovered. The root was considered medicinal. Pomet described it as “a grey resinous root” of an Ivy-like plant. According to Lewis, these roots were sliced and dried for storage. They were characteristically “hard, weighty, and dark coloured with black circular striae (rings)”. This plant very much resembles its relatives, the Sweet Potato vine (Convolvulus batatas), and the Morning Glories vines (Convolvulus spp.). Its flower opens at night, giving it the name Belle de Nuit, or Night Beauty. As for its medicinal virtues, Lemery notes: “It is one of the best Purgatives we now have…if not well dissolv’d, it sticks to the Folds of the Intestines, and raises great Heats and Disorders.” It was noted by most 18th century practitioners as an excellent purger of “watery and serous humours”. It inhibits reabsorption of water from the intestinal tract and therefore works very vigorously. By itself it was taken with the Yolk of an Egg, in Bolus recipes, and with Pills. A Composite Powder of Jalap was made by adding it to Cream of Tartar; this served as a refigerant and a purgative for the entire system, cleansing it of “morbid matter”. Osborn’s use of Jalap is as a ritualistic laxative, to be taken during the course of a disease in order to purge or cleanse the body with its strong laxative effects. He would recommend it to be taken in association with other medicines such as Oil of Juniper, and alternated it with Calomel in his treatment for the Dropsy. Reviewing the Coldens’s writings on ethnobotany and local plant history, and some of the writings or other colonial botanists, it appears as though there was a local equivalent for Jalapa becoming popular–Gillenia trifoliata. A local Euphorbia was also used as a Jalapa, but the evidence for this is not linked at all to the colonial years. The local Smilax species (mostly S. hispida), which possibly bears a large rootstock like the true Jalap, may have been considered a Jalap to some, but the inability to locate its rootstock due to its growth habits and its very delicate stem and roots makes this use very highly unlikely (one would have to dig a trench to find a single root; to find a fibery tuber that was probably not worth the efforts). Some true relatives of Jalapa (a member of the Morning Glory family or Convolvulaceae) exist locally in the Hudson Valley, and may have been seen or interpreted as example of the more famous South American Jalaps being market (which incidentally were also more successful and useful as purgatives), but such use of this plant would have revealed its porr quality as a medicine. In general, this means Osborn was probably using the imported Jalaps. A number of Juniper trees, found growing around the world, were used for their medicinal virtues. Lewis notes that, traditionally, the official drug Juniperi, both berries and resin, came from Holland. Those indiginous to Europe have naturalised in the State of New York, growing on the banks of rivers and other bodies of water. Still, North America has its own species, J. virginiana, (Red Cedar) available for the colonists to make use of, primarily for its berries, wood, and boughs. Estes distinguishes the use of the American and English Junipers. The former served as a stimulant, emmenagogue, diuretic and diaphoretic; whereas the second served as a carminative, stomachic, and intestinal tonic. Today, the berries of Juniper are still commonly employed for their aromatic qualities. They are found in recipes for poultry dressing and serve as the flavoring agent for Gin, which gets its name from the French word for Juniper, “Genievre”, Anglocised to “Geneva” and ultimately “Gin”. Culpeper wrote: “Its berries are hot in the third degree, but dry in the first…They provoke urine copiously.” He considered them to be a remedy for provoking the terms, strengthening the stomach, relieving gout, remedying scurvy, staying all fluxes, breaking the stone, curing the ague, and expelling wind, adding “indeed there is scarce a better remedy for wind in any part of the body, or the colic, than the chemical oil drawn from the berries.” Finally, he notes its value for treating pulmonary disorders such as the coughs, shortness of breath, and consumption. Lewis and Cullen wrote primarily of its use as a diuretic and recommended its essential oil. Lewis also described the fruit as a carminative and stomachic, for which he prescribed the preparation of a spirituous water. He notes the wood and resin are no longer considered Official. Due to their agreeable flavor and aroma, Juniper berries were added to recipes that included less desirable medicines such as Jalap, Senna, and Horseradish, as well numerous proprietary medicines. During the Plagues in France, Comfits were made from Juniper. Known as St. Roch’s Comfits, they were to be carried around in the pockets, and two or three chewed each morning to prevent infectious airs and to make the breath sweet. Pomet described how the wood was burnt, along with the berries, “to drive away or expel infectious air.” Lemery felt Juniper to be “fragrant when burnt” and recommends it for the same. James also agrees but disputes the presence of these volatiles, arguing that “the Plant is involv’d in a great deal of Sulphur”. Ashes from Juniper were also considered highly medicinal. Culpeper considered Juniper to be a powerful remedy against the dropsy, so much that “the very lye made of the ashes of the herb being drunk, cures the disease.” These ashes served as an as official medicine and were known as Sal Juniperi. See: Ol Juniper; Sal Juniper? ?